MotoGP bikes are simply one of a kind. These “prototypes” cannot be purchased by the public and are not allowed on public roads – and for good reason! They are beasts of machines with specific features and characteristics that make them perfect for the MotoGP circuits. In general, you will find the basic components of the bike to be the same year after year, but the bikes will vary in some aspects as new regulations are added. 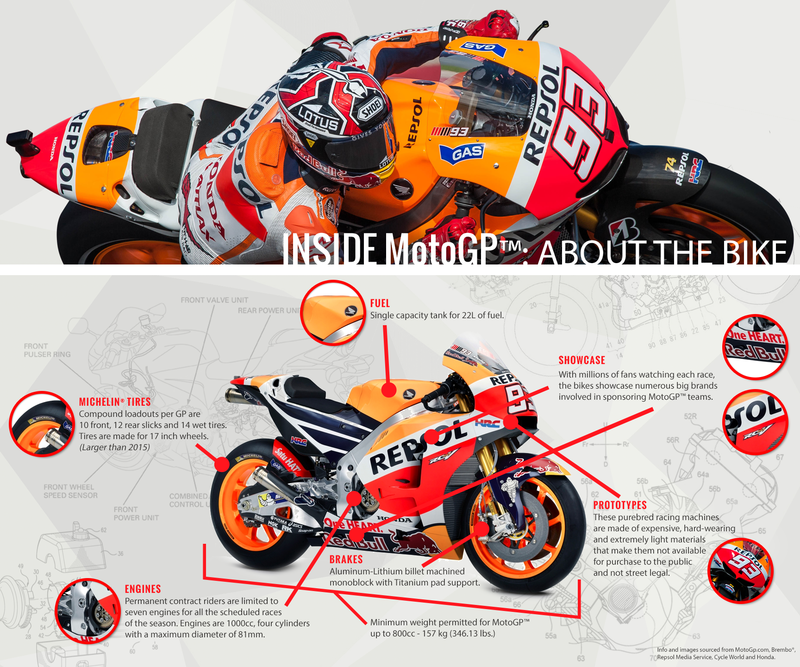 For the current season, we’ve put together an infographic that breaks down the MotoGP bike as well as provided additional information about its various parts. Check it out! Each bike has a single capacity tank for 22L of fuel. The fuel is cooled before being added to tank; no device on the motorcycle can be used to lower the fuel’s temperature. The fuel has to be managed extremely carefully because fuel cannot be added and tanks cannot be changed on the grid. MotoGP bikes are made to show off the amazing design and technological capabilities of their manufacturers. Each bike also showcases numerous brands involved in sponsoring MotoGP teams. You will see a race number at the front and back as well as other logos from the main sponsors and sub-sponsors. Michelin’s tires have experienced several changes throughout the season, particularly at first. The tires are made of 17 inch wheels, and each rider is given ten front tires and 12 rear tires. For dry conditions, Michelin still uses the three basic compounds of soft, medium and hard. According to some riders, the new tires are better under braking and allow for better acceleration. There have been a few bumps in the road as Michelin tires are fundamentally different from Bridgestone tires, but Michelin has been very good about constantly improving the performance of the tires and fixing any situation that has gone wrong. A maximum of seven engines is allowed for each rider. The maximum engine displacement is 1000cc with a maximum of four cylinders and maximum bore of 81 mm. Two-stroke engines are not allowed. Interestingly enough, if a manufacturer failed to win a dry race in the previous season, the riders are allowed 12 engines. MotoGP bikes use carbon discs to improve bike handling and because their performance is superior compared to their steel counterparts. However, because their effectiveness is determined by their operating temperature, carbon discs are replaced with steel discs in certain weather conditions such as rain. 320 mm discs are used at all circuits except Motegi where 340 mm are required and Barcelona and Sepang where 340 mm are optional. The brake calipers are derived from a single block of aluminum-lithium material. See These Bikes at MotoGP™ Race! Want to see these purebred racing bikes in action? Join us at a MotoGP race! Get exclusive access to the MotoGP VIP Village™ where you will enjoy an open bar, buffet breakfast, gourmet lunch, tapas bar and more. Not only will you have great views of the races, but you’ll also be treated to a Pit Lane Walk and Paddock Tour. Don’t miss out!